Exploring Australian Climate and Climate Change | Planet-TECH Associates: Trends. Innovations. Opportunities. [A drought] is not a fierce calamity, nor a dreaded blow, nor any brief struggle; here, in the vast interior of Australia, it is a torturing Titan, overwhelming and resistless, but slow and monotonous in its destruction. Daily the same glaring angry sky, the same cracked, gaping, thirsty earth, the leaden ghostly foliage, the glistening blades of grass—all quivering in the mighty heat. No green thing, no fresh colour, no breath of wind, no sound from earth or air of beast or bird or insect: all in silence—in a breathless appalling silence. Nightly the sun sets in sullen anger, and the moon rises in the cold distant ether. The firmament is clear beyond conception, the stars bright, the moon radiant; all cool, distant, dewless, pitiless. This vivid portrayal of the Australian interior illustrates difficulties faced by explorers and settlers of Australia. Eighty percent of the land in Australia receives less than 600 millimeters of rainfall each year. It is with this understanding in mind that I approach the topic of climate change. How is climate change affecting this already dry and harsh land? And how are Australian individuals, interest groups, and governments dealing with the threat of climate change? Over the next six weeks, I hope to begin to answer these questions. In particular, I will explore Holistic Land Management as a farming technique, developed by Allan Savory of the Savory Institute, being used in Australia as well as many other countries across the world. In short, this farming approach harnesses the power of livestock to help sequester carbon from the atmosphere, combatting climate change and bringing fertility back to barren soils. 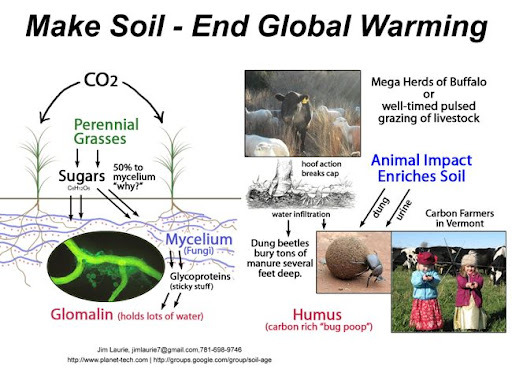 The soil is a carbon sink of great significance because humans have substantial control over it through land use patterns. But first, lets take a look at recent data on climate change. The Australian Bureau of Meteorology released the State of the Climate 2012, which outlines current climate trends. Between the years of 1910 and 2011, annual-average mean temperature has increased by .9°C. The annual-average daily maximum temperatures has increased by .75°C in these same years. The document points out that this, “warming trend has occurred against a backdrop of natural, year-to-year climate variability”. La Nina has had particular effect on the variability of climate year-to-year. Two La Nina events, one in 2010 and one in 2011 have caused “the highest two-year Australian-average rainfall total”. Climate change rears its angry head in statistics detailing sea level rise in the document. Sea levels have risen between 7 and 11 millimeters each year in north and northwest Australia since 1993. This is particularly striking because these numbers are two to three times the global average. In the central, east, and southern coasts of Australia, sea level is more in line with global averages. Not surprisingly, climate change is a big topic in Australia’s agenda. One way in which this manifests itself in politics is the carbon-pricing scheme. Prime Minister Julia Gillard, of the Labor Party, has supported a carbon price as incentive for businesses to cut pollution. As of July 1, 2012 a carbon-price mechanism was implemented in Australia with a $23-a-tonne fixed price. On July 1, 2015 a carbon pollution cap will be applied across the economy and carbon units will be traded. Many see carbon pricing as an important step in supporting the development and exploration of renewable technologies and energy sources. However, criticism of the carbon-pricing mechanism abounds from people maintaining that Australia should wait for other countries to implement such schemes. It is with this very basic understanding of climate, climate change, and political debate in Australia that I begin my exploration of soil in Australia. W.H.L. Ranken, [Climactic Extremes], Colonial Voices: Letter, Diaries, Journalism and Other Accounts of Nineteenth-Century Australia, Edited by Elizabeth Webby, University of Queensland Press, 1989, 242. Australian Government:Bureau of Meteorology, "Climate of Australia." Last modified 2012. Accessed July 12, 2012. http://www.bom.gov.au.